Located overlooking the garden, just to the right of the steps to reception. 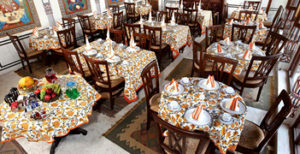 The restaurant, which is fully air-conditioned, is where the breakfast and lunch buffets are served. The rooftop is a fantastic place to catch either sunrise or sunset and is an ideal setting for a pre-dinner drink. This is also where the magical candle lit dinner buffets are served. In the 18th Century, a Marwari Jeweller built Mandawa Haveli for his family. The current owner Mr. Dinesh Dhabhai and his family purchased it in 1984. 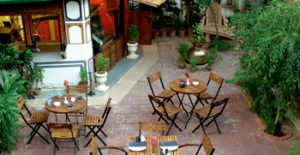 Between 1984 and 1990 they operated a small handicraft shop within the Haveli. Many of the tourists that came through suggested converting it into a Hotel. 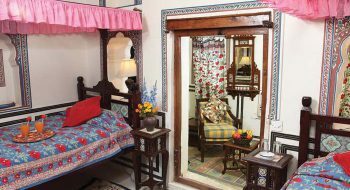 Mr. Dinesh decided to do so and after a further nine years of renovation and repair, employing local craftsmen from Shekhawati, he opened luxury hotel in Mandawa with just one room. 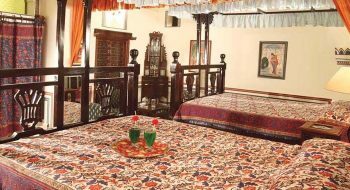 On 14th January 1999, the first tourist stayed in Hotel Mandawa Haveli. The gentleman, from Germany, booked for one night buy stayed four! This gave Mr. Dinesh Dhabhai the confidence that the heritage hotel in Mandawa would be a success. Today there are twenty rooms and two rooftop tents. We stayed in one of the suites and it’s the first time we’ve had a minstrels gallery in our room! Staff friendly and helpful e.g. in helping re mossie protection. The fixtures and fittings are all restored originals. Lovely roof-top dinner and then lovely breakfast room. Air-con great. 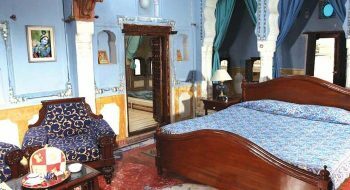 This Haveli is a piece of Rajasthani Architecture, with Frescoes painted on the walls, by CHITERAS– a traditional Painters built in 18th century. We had a family get-together on the eve of DOL, on 21st March, and stayed in the SUITS, at a Bargain. Others were occupied later by a group of FRENCH Tourists. Mandawa was actually located on the Silk Route, via DESRT, SINDH, and Afghanistan to China, Middle East,and Europe, via Turkey. Dry Fruits used to reach from Afghanistan, on the way to DELHI. Now this Trade route is DEFUNCT. Those who have not done the Desert Trip, I suggest to consider this LOOP: DELHI–>MANDAWA–>BIKANEER–>JAISALMIR(CAMEL SAFARI)–>JODHPUR –JAIPUR–>>DELHI. 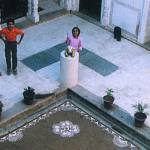 I upload some of the photos of MANDAWA HAVELI for you to see. This hotel is a wonderful place. Each room is different and very cozy. 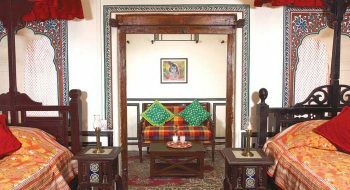 The tipical Haveli style makes you feel thrown back in time. 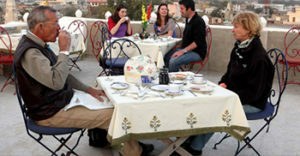 Dinner on the rooftop is very romantic and the dishes are fantastic. Slow Wifi. Who doesn’t want to stay in a 200 year old mansion beautifully decorated with paintings? Well, in January it can be cold and the only heat provided was a hot water bottle. Also their outdoor dining was tolerable only because of charcoal braziers. Our room was actually a suite with a living room and a separate bedroom, but to get to the bathroom, we had to climb out a small doorway, then cross an open balcony. Wifi slow and we were never able to connect, but at least there was hot water. Still, just being surrounded by so much beauty was worth it. 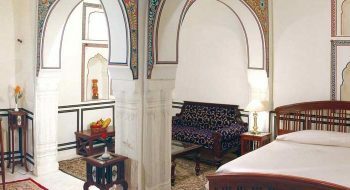 Very good luxury hotel in Mandawa, it’s actually a restored painted haveli – the havelis the region is famous for. Liked the fact that the hotel has made minimum modifications to the haveli, and retained the old paintings and the structure of the building. Staff was helpful. I found the food in this place quite expensive though. 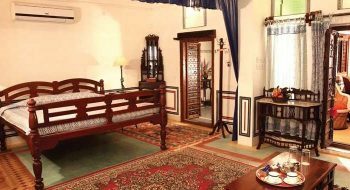 The haveli is very lovingly maintained and you feel like you’re stepping back in time. 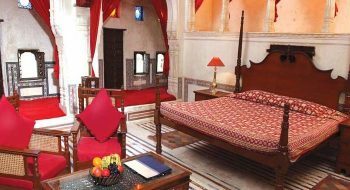 Try Gopesh or Nilesh rooms for old-school luxury. They often have a pleasant fire in the courtyard in cool months and bring you a hot water bottle at night, very homey. The owner, Mr. Dinesh, and the rest of the staff are so very warm and welcoming, they really will take time to talk to you and try to make your stay enjoyable. Unlike most other hotels where we stayed, the food here was quite good. Excellent chai, I couldn’t get enough. This hotel was booked for us as part of a driver-only tour. We were the only guests on Sep 15. Our presence gave the 8 young staff something to do and we were very well treated. When we ordered our dinner, they even throw together a candlelight dinner for us right smack in the middle of the courtyard giving us a very romantic evening together. Before we left, I asked when the next set of guests will be arriving – in 2 days time, the young manager told me. I guess travelling before the peak season has its benefits. Visited Mandawa Haveli after three years. The experience just got better. 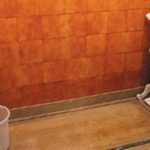 The most important thing about this Haveli is its owner Dinesh Bhai,who love this property and this time around also ,small repairs are going on. Thats was the great hospitality standards are maintained even after years. Manager Hanuman is ever smiling person and staff is always willing to help you. Though dinner was not upto the mark, but still the overall experience is that you can cherish about. Stayed September 2015, travelled with family. Hotel staff are nice and have service mind. 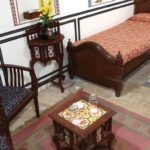 The Mandawa Haveli is a welcoming and interesting stay in a traditional Haveli. Our room was furnished with wonderful wooden furniture, was clean and comfortable with a small lounge area and seperate bathroom. Although it was cold in January, we were kept warm with a courtyard fire and hot water bottles for our beds. Great view from the roof top.